Originally written July 2018 about a difficult time in my life. I am publishing it today in an attempt to show that when life throws you lemons—even financial lemons, it is possible to come out on top. Life doesn’t always go the way that we plan. In fact, more often than not, life doesn’t turn out the way we expect. Things happen to us that are often out of our control. 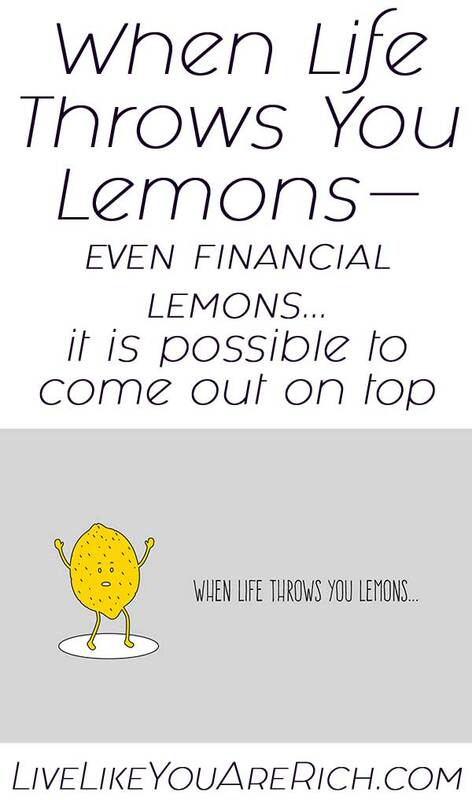 Life throws us lemons. Some get thrown lemons of one or more of the following: injury, death, divorce, job loss, natural disasters damages, and so on. Usually these difficulties bring with them financial difficulties as well. About a year and a half ago, I went through a life crisis and had many of my goals and expectations shattered and pulled out from under me. This personal experience left me in a world of heartbreak and financial hurt. I was doing really well financially previous to this event and afterwards was left in debt, little-to-no income, and completely grief-stricken. I was financially stable and then all of the sudden (due to someone else’s decisions), I was no longer financially stable at all. The majority of my income was lost, unexpected charges were made on my credit card, and life was just crumbling in many ways. As a writer of a blog like this (which covers many financial principles) I felt humbled and somewhat humiliated. This was a tough time for me and I found it hard to write on my blog as I was trying to figure out my new situation, grieve, take care of two sweet toddlers, and complete a full home renovation that I was in the midst of. I talk about how to get out of debt here. And one of the things I say is, ‘Just as the first step in stopping a sinking boat is to plug the hole where the water is leaking in, the first way to get out of debt is to avoid adding more to it’. I knew I was sinking financially. I had to stop spending and work to get out of debt. I also understood that I didn’t have a lot of time to just sit around and mourn. So, I dug deep, had faith, found strength, and went to work. I stopped spending money—except an allotted amount I had left in my bank account for the renovation I was in the midst of, I also spent a minimal amount each month to buy food and pay for necessities. I sold many items I had around the house that I didn’t need. I sold over $2,500 worth of stuff I had in my home—this helped significantly. I found a way to get more income by seeking employment outside of the home for a time. I waitressed evenings when my ex-husband had the kids until I was out of debt, then I went back to being a stay-at-home/work-at-home mom. I increased income in my business. I began finding more creative ways to make money and cut costs in my business. I worked hard to make money in other creative-yet honest ways. I found a legal way to rent a portion of my home out. I sold my SUV and downsized. I borrowed my parents sedan as they are on a humanitarian mission and do not need it. I paid the insurance and upkeep. I saved money via coupons. I didn’t want my kids to suffer and feel the loss, so I filled our free time with fun events and things we could do for free. I talk about the power and principle of being generous and paying a tithe (even in desperate times) in my book here. I also found ways to be frugal and do things on my own. I did a lot of the remodel myself. Saving a ton by not having to hire it out. Although I don’t love being the recipient of acts of service, I allowed others to serve me. I allowed many friends and family to step in to help me in a variety of ways including: taking care of my kids once in awhile, helping with yard work, helping me paint and do odds and ends to finish up my home renovation, bringing me a meal or a goodie, and offering words of support and encouragement. I am so grateful for those neighbors and friends who offered their support. The results were great. The hard work ‘paid off’—yes the pun is intended. I am out of debt, my house is put back together, I have increased my income, and I am working on a savings. Even better, my children and I are happy and have healed—we are stronger for what we’ve experienced and worked through. We managed to make lemonade out of some pretty tough lemons. It took me 8 months of diligent frugality and hard work to finish the renovation, get out of the debt this event caused, and to start to create a savings again. As with any disastrous event in life, it takes time to recover: financially, physically, emotionally, etc. So be patient with yourself if you have unexpected lemons come your way. Make good use of each day and with time, the wounds will heal, you’ll get better financially, and eventually you’ll come out on top. Note: I wrote this post back in July 2018, about 8 months after this difficult financial and life event occurred. I never posted it because I had forgotten I even wrote it. I wanted to post it today as I was looking through my draft archives and came across it. I hope it may help others who are struggling financially.